**Disclosure: I was provided a gift card to sample Qdoba's summer shrimp menu items. I was not compensated for this post. All opinions are my own. I recently made my first visit to a Qdoba restaurant. I don't live too far from the Indiana border, so I made my way over to the Highland, Indiana location to try out the new Fire-Roasted Shrimp menu offerings that are here for the summer. 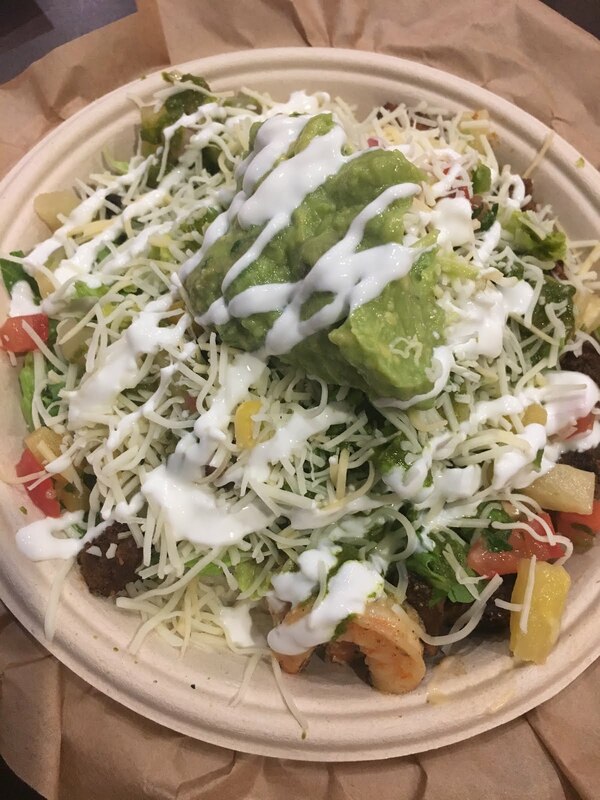 I love places that are quick, but also let you customize your meals and that's just what you get at Qdoba. 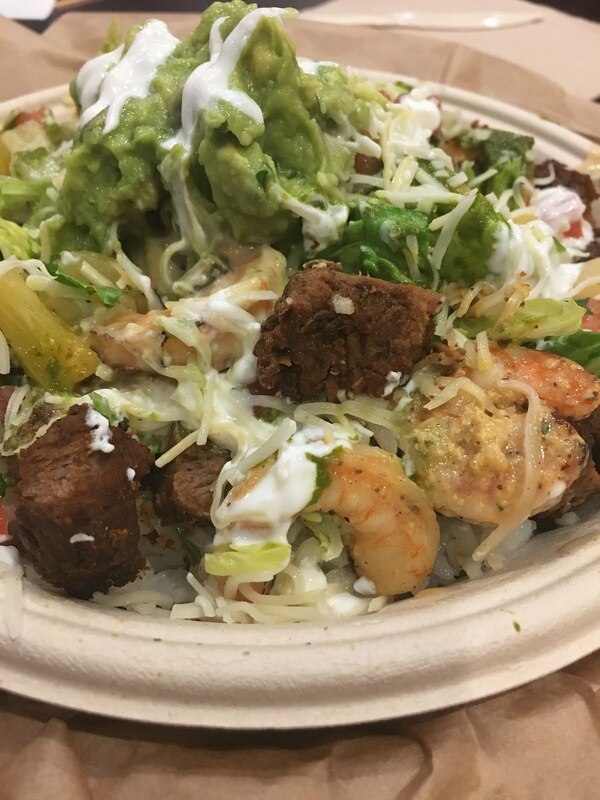 This summer they're offering three new items that feature their Fire-Roasted Shrimp - the Surf and Turf Burrito Bowl, Tropical Shrimp Taco and Fire-Roasted Shrimp Salad. I am not one who is huge on spicy foods, so I'm always a little leery of what to order from Mexican Restaurants. I was pleased that despite the "fire-roasted" description, the shrimp wasn't too hot for me to handle. It had a little kick and some nice flavor, but not too much of it. 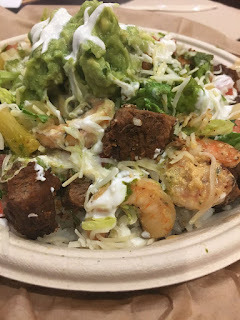 I ordered the Surf and Turf Burrito Bowl that was loaded with shrimp and steak and then customized to my preference with a little bit of black beans, some guacamole, lots of lettuce and cheese, some pico de gallo and some sour cream. The portion was pretty huge and I took the rest home for a snack later that day. 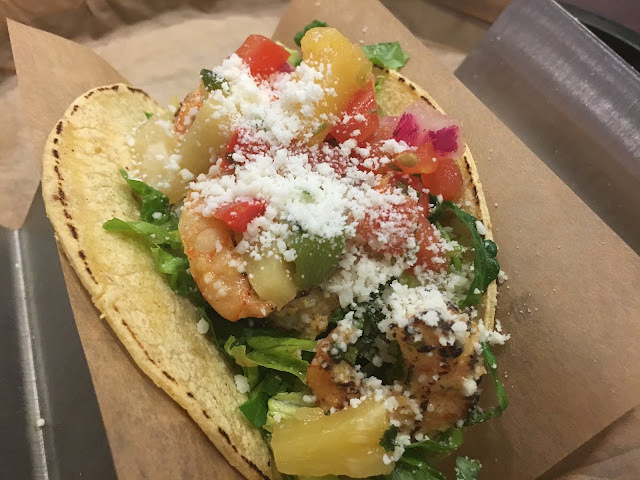 It also happened to be Taco Tuesday when we were there, so I couldn't pass up the Tropical Shrimp Taco, which included a sweet salsa with pineapple that was a great combo. 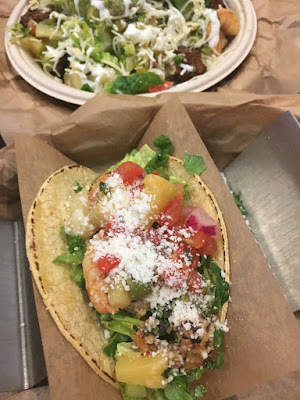 I look forward to my next stop to try even more of the menu items and get another taste of the shrimp specialties that are there this summer for a limited time. 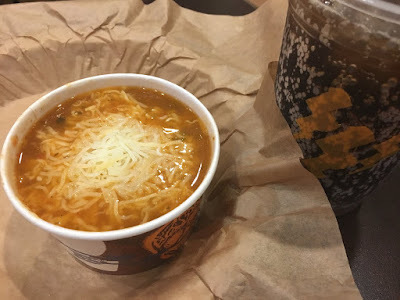 By the way, if you like soup, the tortilla soup got a thumbs up from my dad, who was my dining partner that day. Having just had dental work done, he had to watch me eat the scrumptious shrimp taco and my burrito bowl and get by with a bowl of soup, but he's a big soup fan anyway and said he would definitely order it again. 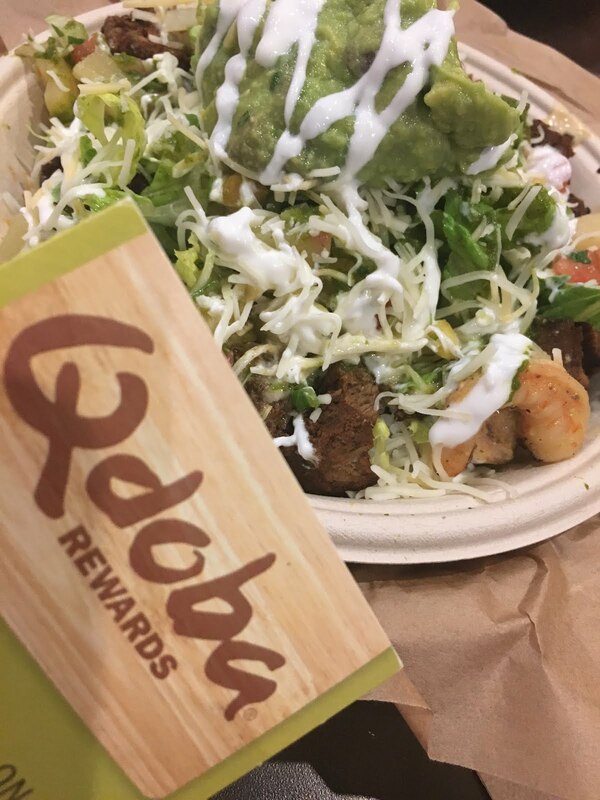 Qdoba partnered up with Chicago Foodie Sisters to let one of our readers try out the new summer shrimp offerings with a $30 gift card. Enter below for your chance to win. Giveaway starts at midnight on July 14 and runs through July 21. A winner will be selected at random and notified via email. There are several ways to enter - be sure to do them all to up your chances. Good luck! I'm obsessed with Tacos. They are never boring and I'm always in the mood for them. I also love sopas! It's just soooo delicious! For tacos and quesadillas, it's Taqueria El Chorrito in Rogers Park for me! SO good! I really love fish tacos! I love a good taco personally- especially with rice and beans on the side...oh and chips. Qdoba's chips are SO tasty! Thanks for the chance! I love all Mexican food!! But my favorite is a good quesadilla on a chewy homemade tortilla! Thanks for the giveaway, those shrimp look yum!!! I love taco and chimichangas! I love tacos with pulled pork and all of the workings on it!